It's the last day of the month! And as promised, it's the last day (probably) that I will push and beg for the Surf & Turf FUNdraiser. Of course it'll remain open, just like the others, and it will stay on my sidebar, we just won't have a plug on every post. Cashmere: Does that mean all these Fish Stick Kicks will be ours?? Leo: I claim all the left over nip! Glitter: Fine, I get the octopussies! Cashmere: I claim all the silvervine fleecy balls! And the silvervine! Hang on, guys! People can still get their Surf & Turf FUNdraiser sets! You can't steal them all!! So please, if you haven't got your set by giving a donation to Winnie's Wish, consider helping the kitties and getting your kitties some fun things! Minimum donations of just $18 US get your kitties a nippy Fish Stick Kick, a nippy, crocheted Mousie, a nippy crocheted Octopus, a nippy Chick-hen, and a silvervine fleecy ball! Please join in if you can! Share if you will! And thank you for putting up with the plugs every day! Once we get everything totaled up, we'll share the grand total going to Winnie's Wish! Thank you everyone! We love you!!! We're ALL thankful around here everyone who has helped with the Surf & Turf FUNdraiser! It's going very well! We'd be even more thankful if we could end it with a big bang! If you haven't already joined in on the fun, please thinking about it! And please share! We are set to stop pushing it at the end of the month (though you can still get in on it at any time, just like the rest of the FUNdraiseirs!) and would love to have a nice big check to send to Chrystal for the Winnie's Wish kitties! We're so thankful for every one of you for being our friends! Thank you all for your wonderful birthday wishes yesterday! I got lots and lots of cuddle time with my Leo! Snuggles from Cashmere and some good pets and belly rubs with Glitter! That's a good day in my book! Would you like a gorgeous Snowflake in July?? I guarantee you'll want to keep this one around all year! She's a sweetheart who loves to talk and really really needs a home of her very own! 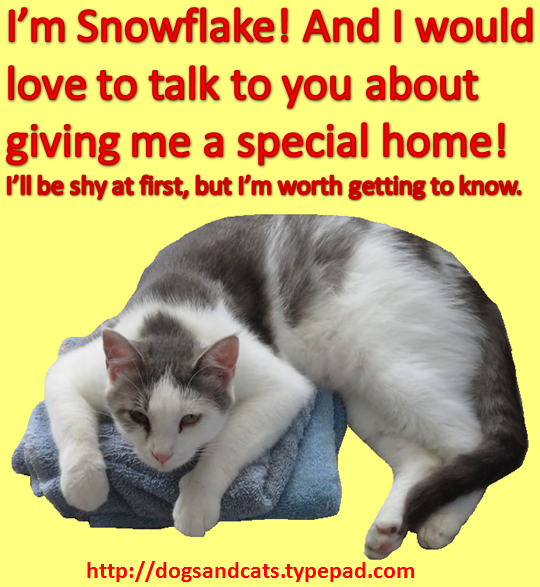 Won't you find room for a sweet Snowflake in your home? If you can't, then won't you share her just in case her forever family is someone you know? And ask your friends to share her too, because it could be one of their friends! Lets get this pretty girl in front of a whole bunch of people so she can finally have a home of her very own! If you haven't already checked out the Surf & Turf FUNdraiser, please take a minute to go to the FUNdraiser page! You wont regret it! Cool toys in exchange for donations to Winnie's Wish! Makes your kitties happy, makes the Winnie's Wish kitties happy! Win Win! Leo here, shoutin' it from the rooftops! Well.. I's not allowed outside, so I's gonna shout it from the highest perch on my cat tree! And it's a big one too! Really big! Don't mind her when she's screamin' that 37 ain't a big one, no one believes her one bit. In fact, everyone scoffs at her and snickers! Not even close mom! hee hee! We tried askin' her what she wanted fer this big birthday... can you guess what she said? If you been readin' here long, I'm sure you know! Mommy says, "I want homes for all of the kitties in the rescue you came from. I wish every Winnie's Wisher could have a good home like you and your sisfurs have, with people who love them and want them and take great care of them!" We want that too! Some of them kitties have been there since I was there! And I been here four years! Hey! That mean... on my birthday next month, I's gonna be 5!!! Hey mommy! We gonna have the same number of birthdays! Well, you gots another number with your 5... hee hee! Sheesh, keep yer cool mommy, I didn't tell nobody how old you is! *snickersnickersnort* I can't help it if they's all good guessers! Ok ok, anyway.. mommy has another wish for her birthday. And I know you can guess this one too! Mommy says: "I'm hoping and wishing that anyone who's still thinking about the Surf & Turf FUNdraiser will jump on board soon!" See, at the end of the month, which is soonly, momma's gonna stop buggin'.. I mean advertising it! (you know she always leaves them open though) so we all hope you'll help out Winnie's Wish AND get you some cool toys while you're at it! A birthday present for you!! hey, that's cool mommy! It's your birthday and if they support Winnie's Wish, THEY get the presents! Pawsome! Go ahead and click the link to get all the details! it's just a tiny $18 green papers (US) to get your thank you toys! Hope you have the bestest birthday ever mommy! On Wednesday I posted a picture of Glitter doing the Dangle with one front foot and it got a lot of comments on her beautiful ruff and furs! (I won't say she was offended by someone calling it a 'beard', *coughcoughMarksMewscough*, ;) but she did go around saying "I'm not a boy!" for a while) So I went back and looked and wow, I hadn't even noticed how much that picture showed off her long and lovely ruff/bib! Almost a shame then, that yesterday she went to the groomers and had it trimmed shorter! You see, it was so long that when she licked it, no matter how far she lifted her chin up, the ruff furs would get stuck in her mouth! And she was always dipping it in the water dish! So since she (and Leo) had to go anyway, I asked if they could shorten it, but not shave it off. I think they did a pretty good job of it. From a different angle as Wednesdays. See her ruff goes almost to her 'elbows'! Ok, not a great picture because she was avoiding us like the plague after her trip to the 'beauty spa' but you can see that it's much shorter! I'd say half as long! Glitter and Leo went to the groomers for a 'spa day' because they had both gotten so many mats and they refuse to let us do anything about them! Ok, Glitter was fine with me trimming little ones from her chest as long as she'd been properly subdued by lots of pets and tummy rubs, but the minute I tried anything with the huge ones on her back legs, girlfriend took off with extreme prejudice! They were getting pretty bad by the time I could get an appointment too, yikes. Leo refuses tummy rubs, so you can imagine how thrilled he was when I'd try to trim a mat from his chest.. got one once when he was sleeping hard, but that was it! Even reaching for scissors was a signal for him to take off! He also had some huge ones on the back legs. I could touch them, but there was no way for me to get them. What's funny is that Leo's been with me for four years and last year is the first time he's matted up like that. I don't know if it's just been particularly humid the last few years or what but wow! And both of them need occasional 'sanitary trims' to keep them from getting clingons..
Cashmere does not mat up, does not get knots, and does not need sanitary trims because she does not have long fringe hair down the back of her legs. Cashy is a very low maintenance girl! Thank goodness one of them is, we only have two carriers, lol! I haven't been able to get a look at Leo's tummy, but you can see that his long belly furs do not reach nearly to the floor any more. Glitter rolled over last night and showed off that her whole lower tummy and inside thighs are bare! She's all soft pink skin there! I knew the mats there were bad, but wow. I am betting Leo's bare too, but he's still too ticked for me to check. So we may not be so fluffy this Friday, but we sure are more comfortable! Here's hoping you all have a very comfortable weekend! While you're having a comfortable weekend, we hope you might take advantage of our Surf & Turf FUNdraiser! And/or, would you please share it? That way we can make lots of comfortables and happies for the kitties of Winnie's Wish! After I posted the first pictures of kitties who'd received sets of Surf & Turf FUNdraiser toys playing with them, I got an email of another kitty playing with the toys. The kitty mom said that she was sorry she'd missed sending in her picture and seeing her kitty be "famous" too. 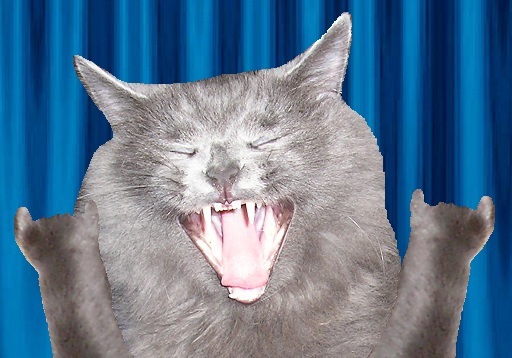 Well, if getting posted on my blog makes a kitty famous, then wish granted! 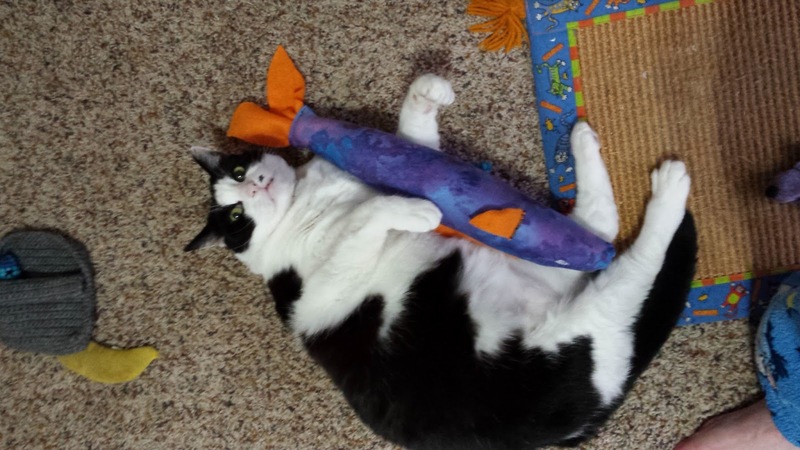 Here's Cindyann's now famous kitty playing with her Fish Stick Kick! I also got a picture from Kalli showing her oldest kitty, Pixie, who is 14 or 15. She said that as soon as the package was opened, Pixie started playing like a 4-5 month old kitten! I think it's safe to say that this is another couple of happy kitties who also helped make Winnie's Wish kitties happy! Would you like to help make kitties happy? Yours and Wishers? All you have to do is make a minimum donation to Winnie's Wish of just $18 US (extra postage for international) and your kitties will get a wonderful set of toys! I think if the 'famous' kitties posted here and Monday could speak, they'd tell you it's worth it! Have a look at the Surf & Turf FUNdraiser page and see for yourself! If you already have your toy set, please consider posting to your own blog with a link to the FUNdraiser page to spread the word! If you don't have a blog and want to see your kitties become 'famous' too! Go ahead and send me a/some picture(s) and I'll post them! Thank you to everyone who's participated already! Your donations are making a world of difference to the kitties of Winnie's Wish! 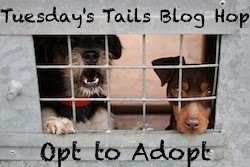 Cave Girl and Opt to Adopt Blog Hop, Smokey! Have I ever mentioned how much I love to see the kitties sleeping in the caves on the cat tree? It's just so cute! I cant help but take pictures of it, no matter which cat, no matter which cave! I was sound asleep, then I heard that whirring camera. You know I can't let you get a shot of me with my eyes closed in the cave. That would break the kitty code! Ok, here, I'll squint at you. Because, frankly, once you put that thing away and out of reach, I'm going back to sleep! This week I'm sharing Smokey! A great Winnie's Wisher who just wants a person to love and a cat buddy to hang out with! If you don't have a buddy for him in your home, that's ok, he has a best friend who's being fostered with him! Either way, won't you consider giving him a home? And if you can't, will you share him and help him find his forever? Surf & Turf FUNdraiser toys have been making their way to the homes of kitties for a little while now. And now I have pictures of some of these happy kitties with their fun toys! Sara sent pictures of her kitties! I think the Fish Stick Kick is a favorite there, no? Dina also sent pictures of her kitties! They seem pleased with their toys too! Dina also sent a video! Do you think your kitties would like some fun toys too? The Surf & Turf FUNdraiser is going strong! All it takes is a minimum donation of $18 US to Winnie's Wish and a set of five awesome toys will be on their way to you! Have a look at the FUNdraiser page and see if it's something you might like your kitties to have! Every donation helps the kitties of Winnie's Wish! They are about full up, so if you know anyone who would like to adopt a sweet kitty, please steer them to the wonderful kitties of Winnie's Wish! Distance is not a problem, transport can be arranged! I love when fluffy Leo sleeps belly up! The foot in the air is a bonus! zzzzzzz * Do I hear a camera..? Lemme open one eye.. oh crap, there it is. Glitter, (in the ham-mick in the back): Yeah, say that after you see the angle of THIS shot. Lets talk Surf & Turf. Some kitties like their toys to come from the sea. Some kitties like their toys to come from the land. Some kitties just like the nip! Some kitties just want the silvervine! 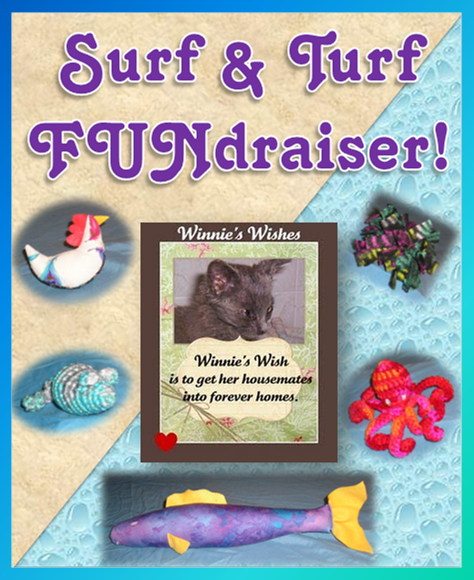 No matter what your kitty likes, we have them covered in the Surf & Turf FUNdraiser! The kitties of Winnie's Wish benefit from every minimum donation of just $18! It keeps them in food and litter, vetting and other day to day necessities! Your kitties get to play and the rescue kitties get to live! Not a bad trade, yes? So please, join in on the FUNdraiser! You wont regret it! Reshelved and Opt to Adopt Blog Hop, Smokey!